Power resistors are designed to withstand and dissipate large amounts of power. In general they have a power rating of at least 5 Watt. They are made from materials with a high thermal conductivity, allowing efficient cooling. They are often designed to be coupled with heat sinks to be able to dissipate the high amount of power. Some might even need forced air or liquid cooling while under maximum load. Some are wire wound, some are made from wire grids for ease of cooling, but the common thing for all power resistors is that they are built to dissipate the most power while keeping their size as small as possible. An example use for power resistors are load banks used to dissipate power generated during engine braking in vehicles using electrical motors, such as locomotives or trams. A power resistor is a resistor designed and manufactured to dissipate large amounts of power in a compact physical package. Wire wound resistors are made by winding a metal wire around a solid form, often made of ceramic, fiberglass or plastic. Metal caps are attached to the end of the winding and metallic leads are attached to the ends. The end product is often coated with a non-conductive paint or enamel to offer some protection from the environment. Wire wound resistors can be built to withstand high temperatures, sometimes up to 450 °C. These resistors are often built to tight tolerances thanks to the material used, an alloy of nickel and chrome called Nichrome. The body of the device is then coated with a non-conductive paint, enamel or plastic. There are several winding methods. Some of them are: helical winding, edge-winding and bifilar winding. The helical type is the ordinary winding in which a wire is wound in a helix around a cylindrical core. Since the wire is coil-shaped, this type of resistor also has a certain inductance. To avoid the potential interference with other devices and the generation of unwanted magnetic fields, wire wound resistors can be made using a bifilar winding, which is wound in two directions, reducing the electromagnetic fields created by the resistor. Edge-wound resistors are made by winding a strip of metal by its wider edge. These are usually coreless, air-cooled and can dissipate more power than the helical type. Grid resistors are large matrices of metal strips connected between two electrodes. They vary in size, but can be as large as a refrigerator. It is not uncommon to see grid resistors valued at under 0.04Ω and can withstand currents of over 500 amperes. They are used as brake resistors and load banks for railroad vehicles, neutral grounding resistors, load testing of generators and harmonic filtering for electric substations. Chip resistors are resistors which look like integrated circuit chips. Surface mount power resistors are made from many different materials, such as pressed carbon, ceramics and metal (cermet resistors) or metal foil. Wire wound chip resistors are also available. 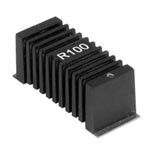 SMD resistors are actually smaller form, surface mounted chip resistors. The resistor itself consists of a metal oxide film deposited onto a ceramic substrate. The thickness and length of film determines the resistance. They have power dissipation ratings much lower than those of grid resistors or water resistors and can usually dissipate no more than a few watts, provided they have appropriate cooling. Water resistors are consisted of tubes filled with a saline solution with an electrode at both ends. The concentration of salt in the solution controls the resistance of the resistor. Water in the tube provides a large heat capacity which allows high power dissipation. Some high power water resistors use in pulsed modes utilize copper sulfate solutions instead of saline. Liquid rheostats, or salt water rheostats, are a type of variable resistors in which the resistance is controlled by submerging the electrodes into a saline solution. 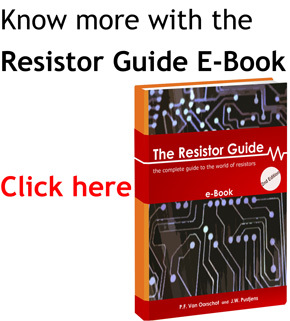 The resistance may be may be raised or lowered by adjusting the electrode position inside the liquid. The mixture must not be allowed to boil in order to stabilize the load. Liquid rheostats are slightly outdated, but are still constructed for use in some diesel generators. Power resistors are used when there is a need to safely convert large amounts of energy into heat using electrical energy as a medium. They are used as controllable power dissipation devices, protective devices and devices that simulate real world loads. High power resistors are used in locomotives and trams to safely convert kinetic energy of the vehicle to heat. Since the energies involved in stopping heavy vehicles moving at high speeds, classic disc brakes would wear out too fast and their maintenance would be too expensive. Because of that, regenerative braking tends to be used. In regenerative braking, kinetic energy is transformed to electrical energy and fed back into the supply network. However, when regenerative braking is not available, power resistors are used. Resistance brakes offer controlled braking power without introducing wear to the parts. It is often necessary to dissipate many kilowatts for extended periods of time. Load bank resistors are devices used to safely simulate a real-world load. They are used to load-test generators, turbines and battery UPS systems. Resistive load banks provide a known adjustable resistance value in a compact package as opposed to real loads which can be dispersed over a large area, random in value and are usually not exclusively resistive, but may have an inductive or capacitive component as well. AC load banks can withstand and dissipate as much as 6 megawatts of power, which is quite a lot, but such large load banks can be the size of a room, and they are equipped with active cooling to prevent thermal damage. Neutral grounding resistors are power resistors used in power grounding of Y-connected generators. They are used to limit the fault current as well as transient over-voltages and allow protective relays to be used in such applications. Neutral grounding resistors are rated at up to 8 kilo amperes and are mostly used in medium-voltage AC distribution systems. When these resistors are used, even if a grounding fault occurs, it is much easier to locate because of a limited number of possible fault locations.